We are fully licensed and insured – and our team is equipped to handle any project, regardless of its size or scope. With many years of knowledge and hands-on experience, our professionals have the ability to exceed your expectations and deliver a level of satisfaction that is far superior to our competitors. Our family owned company was started over 30 years ago when Tom and Dan Berg first opened Berg Brothers. After a separation from Dan, Tom took over our business with his three sons. In 2003, Tom’s son, Ford, branched off to start his own construction company, bergconst.com, which handles commercial site work, demolition, and utilities. As a perfect addition to these projects, paving was later added to their list of services. In 2011, Tom’s son, Colt started Berg Paving to better serve our existing clients’ needs and to have a better focus on the residential and commercial paving market as a whole. 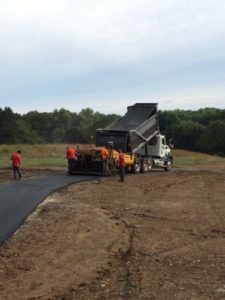 Today, we have become one of the premier paving companies throughout Berks County and beyond, due to our level of professionalism and competitive prices! For more information about our Morgantown based company, please feel free to contact us today. We will gladly answer any further questions you may have, and look forward to serving your upcoming paving projects soon!